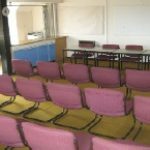 St Mary’s Church Hall is available for hire and is ideally positioned to offer a superb venue for social, business and sporting activities. It has a fine history of service to the community, and comprises three separate halls ; the “Auditorium Hall”, the “Studio Hall” and the “Courtyard Hall”. All of our halls have kitchen and toilet facilities and are entirely independent of one another to give users total privacy. At St Mary’s we provide a home for many local organisations that use the hall to meet regularly. 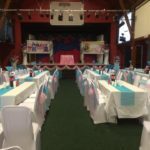 We also welcome a whole range of guests who hire St Mary’s Church Hall for family celebrations, children’s parties, business meetings, sporting events and banquets. We are extremely proud that St Mary’s Church Hall is the home of The Moat Players, the well-known and highly acclaimed amateur drama group. The Moat Players have been entertaining the local community and beyond, for nearly 60 years and they enjoy the superb stage facilities that the Auditorium Hall offers. The building has a large auditorium and stage, making it ideal for dramatic productions. In addition, the very high roof makes it superb for games such as badminton. The stage has excellent lighting and there are good facilities backstage, including dressing rooms, storage space and two WC’s making it fully self-contained for dramatic productions. 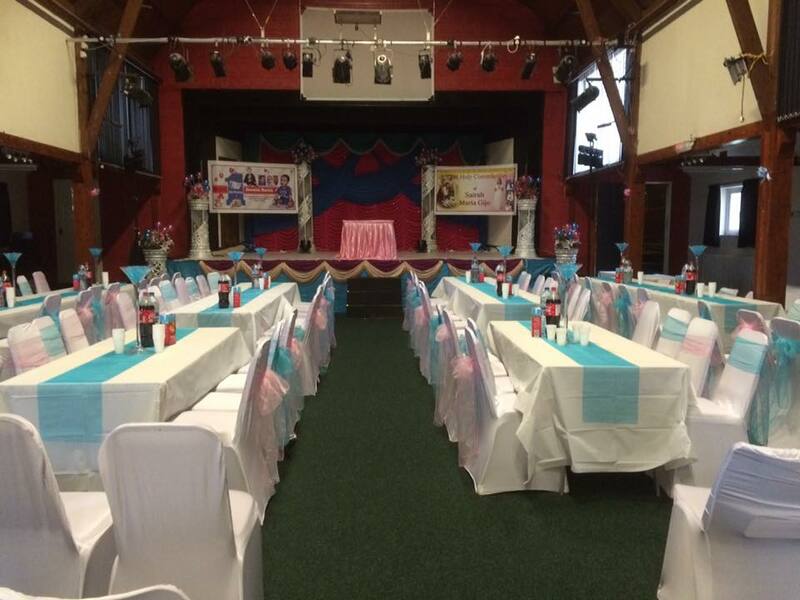 The Auditorium Hall is ideal for holding children’s parties as it is large enough to accommodate a bouncy castle or other large play equipment. There are various side rooms off the main hall that are used for meeting rooms and storage. Within the hall there is a well-equipped kitchen that has direct serving facilities into the hall. You enter the hall via a large entrance lobby with separate female and male cloakroom and toilet facilities. The hall can accommodate up to 180 people seated or 300 standing. This is a comfortable carpeted meeting room, ideal for small meetings. Accessed by a staircase it is suitable for groups of up to 30 people seated and has fine views of the surrounding area. It includes a small kitchen and a toilet. Adjacent to the main hall is a smaller and self contained hall, The Courtyard Hall which has a seperate kitchen and separate female and male cloakroom and toilet facilities. It also has it’s own exclusive car park, however the larger car park is also available to Courtyard Hal users. The Courtyard Hall has been the home of the Solihull Model Railway Circle since 2005. The friendly team will be pleased to discuss your requirements with you before you arrive to ensure your visit to St. Mary’s Church Hall is a pleasant and memorable success.